So you're out of college, drowning in debt and probably wondering, "Was it really worth it?" Whether it was or wasn't is probably yet to be seen. But either way, you might be desperate to rid yourself of student loan debt -- especially if the amount of your debt is on par with the national average, which is more than $35,000 for the average student graduating in 2015. The good news: Employing all of the following 10 tips can help you get rid of your student loans in just one year. There are, however, a couple of things to consider, such as how much you owe versus how much you're earning. If your base loan is $30,000, and you're only making $35,000 a year, eliminating your debt within 12 months might not be an achievable goal. And if you've already begun a family, these tips can be very challenging to employ. So, it might take you two, three or more years instead to pay off your debt. But nonetheless, use these strategies to reduce or erase your student loan debt. It will be a tough year, but it will be rewarding when you see your loan balance shrink to $0. 1. Seek a job offering student loan repayment reimbursement. 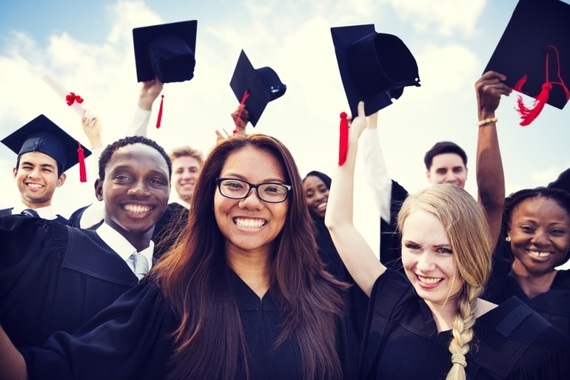 Many government agencies and other employers provide employee recruitment and retention incentives in the form of student loan assistance. When looking for your first real job after college or perhaps seeking an employment upgrade, look for employers who offer programs such as these. 2. Take on extra work. If you've got the time and energy, pick up extra work. Whether your current gig offers overtime or you can make money on the weekends cutting grass, consider taking on a part-time job to add to your monthly income. Who knows -- maybe working 60 to 80 hours a week for a year will eliminate thousands of dollars from your indebtedness? If so, the short-term grind will be worth it for the long-term gain. 3. Set up payroll allotment. Check with your job's human resources department, and ask to set up payroll allotment. With payroll allotment, a certain amount of your regular paycheck goes directly into another account and not into your main checking or savings accounts. If you don't see the money, you won't be tempted to blow your paycheck. And in a short period of time, you will have accumulated a nice chunk of change that can be used to make a lump sum payment on your student loans. 4. Say 'no' to the 401(k) plan. Opposite most advice you're most likely receiving, if getting out of debt is your No. 1 goal, consider delaying your retirement savings by 12 months. Delaying the "benefits" of one year of 401(k) contributions in favor of faster debt servicing is worth it in the end. The amount you're paying in loan interest will probably be more than you earn in your 401(k) after you factor in market risk and taxes due. 5. Do more things at home. You've probably already learned that you can save more money by doing more things at home. Making your meals, watching movies on Netflix and even mixing your own cocktails can be much cheaper than going out. Use the money you saved to go toward your student loan payments. If college didn't burn you out on shared living spaces, consider the cost savings of acquiring roommates or seeking a lower-cost living arrangement. Sharing the rent and electric bills or renting a room in a house -- instead of renting a full apartment -- could drastically cut back monthly living expenses. 7. Sell your things online. Do you have assets that you can sell? If you've acquired valuable items that you no longer need or want, consider selling them online. Check out sites like eBay and Amazon. Regardless of your environmental status, no one can deny the high costs of transportation. Look into rideshare and carpool options. Or, see if your city offers public transportation. It might not always be the most luxurious way to get around town, but gas, insurance and maintenance on a car add up quickly. 9. Resist the urge to shop. Do you need new pants or just want new pants? If you can make your wardrobe, cell phone and shoes go the distance for 12 months without upgrades, do it. You'd be surprised by how much you save when you stay out of the mall. And here's a bonus tip: Unsubscribe yourself from the daily email advertisements for those "can't miss sales!" so you're not tempted to waste your money on something you don't really need. 10. Move back in with Mom and Dad. Moving back home is the least favorable option for many college grads, but in most situations it's an opportunity to drastically reduce living expenses. If your parents would love to have you home to snuggle with one more year -- and they're willing to let you off with low to no overhead costs -- this is a sure-fire way to cut costs and dedicate yourself to debt servicing. You might be ready to hit the ground running. Or, you might be saying, "Ehh ... maybe in a few years." If paying off your debts within a year is simply not feasible, look at your next option: Figuring out how to reduce the amount of time you're in debt. The average payback schedule is 10 to 20 years, so your goal should be how to reduce that schedule down to seven, five or even two years. This can be accomplished by creating a detailed budget, utilizing a debt snowball strategy and implementing some of the 10 tips above.